Broccoli sabzi recipe – healthy yet delicious sabzi made from broccoli, capsicum and onion. It is nothing but making broccoli recipe Indian style. Broccoli is one of the least favorite vegetables for many. I was also one of those too until I made this sabzi recipe. Do you hate broccoli? If so, I bet you haven’t tried it this way. Trust me, give it a try and you will thank me. You can also try this broccoli paratha. Cooking the ingredient/vegetable with right pairing and right spices always does matter. This recipe is the example of it. 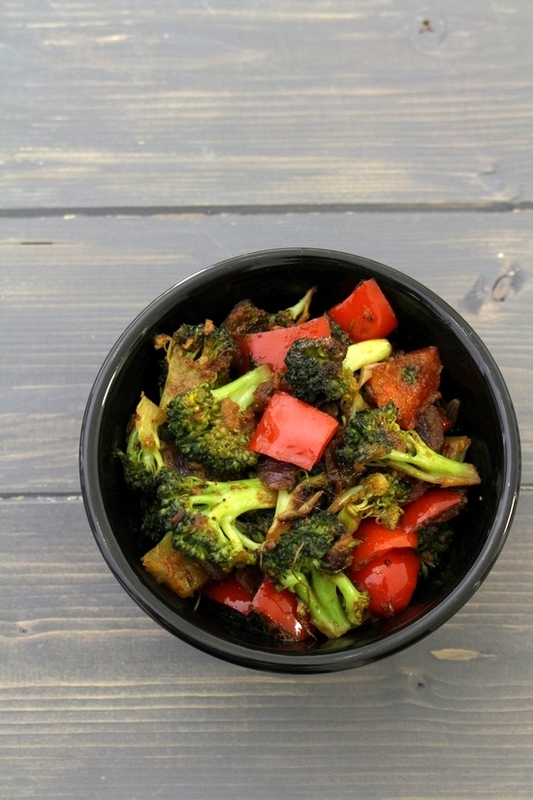 Broccoli goes perfect with bell pepper (capsicum). The spices added complements well both of them. A PERFECT Indian broccoli recipe !!! — Broccoli: It is packed with nutrients and that are best retained by not overcooking it. Overcooked broccoli equals to mushy, flavorless and lost of nutrients. It does get cooked quickly and taste better when kept slightly crunchy (not cooked till soft). — Bell pepper: Here I have used red colored bell pepper, just because it will be photogenic with green broccoli. You can use green capsicum as well. — Kasoori methi (dried fenugreek leaves): This adds a flavor punch to the broccoli sabzi. I highly recommend that you do not skip it. 1) Heat the oil in a pan on medium heat. Once hot add cumin seeds and let them sizzle. 2) Then add onion and sprinkle some salt to speed up the process. Cook till onions get soft and translucent or light pink in color. 3) Now add ginger paste and garlic paste. 4) Mix and saute for a minute or till the raw smell of ginger garlic goes away. 5) Now add broccoli florets and capsicum. 7) Also add red chili powder, coriander powder and remaining salt. 8) Mix very well, so all the masala is coated to the veggies. 9) Cover the pan and cook till broccoli is cooked (not soft, mushy but slightly crunchy). 10) Do stir once or twice during the cooking and make sure that it is not sticking to the pan. 11) Lastly add garam masala and kasoori methi. 12) Stir well. Turn off the stove. It is ready to serve. If not serving right away then keep it covered, so it stays warm till the time of serving. Serving suggestions: This broccoli sabzi can be served with roti/phulka, paratha. It can be served as a side dish with your dal-chawal. This is one his favorites to take into lunch box with roti and kachumber. 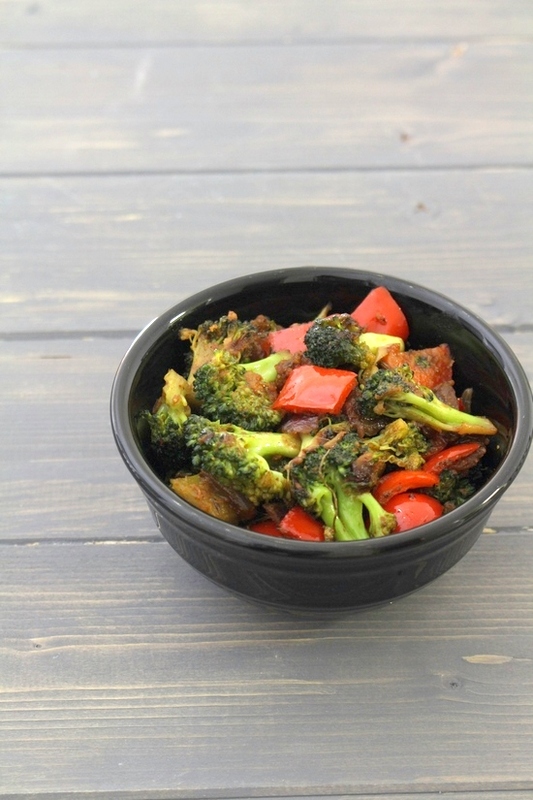 Broccoli sabzi recipe - this is Indian style dry stir fry recipe using broccoli and red pepper. Then add onion and sprinkle some salt. Cook till onions get soft and translucent or light pink in color. Now add ginger paste and garlic paste. Mix and saute for a minute. Now add broccoli florets and capsicum. Mix well. Also add red chili powder, coriander powder and remaining salt. Mix very well, so all the masala is coated to the veggies. Cover the pan and cook till broccoli is cooked (not soft, mushy but slightly crunchy). Do stir once or twice during the cooking. Lastly add garam masala and kasoori methi. Stir well.